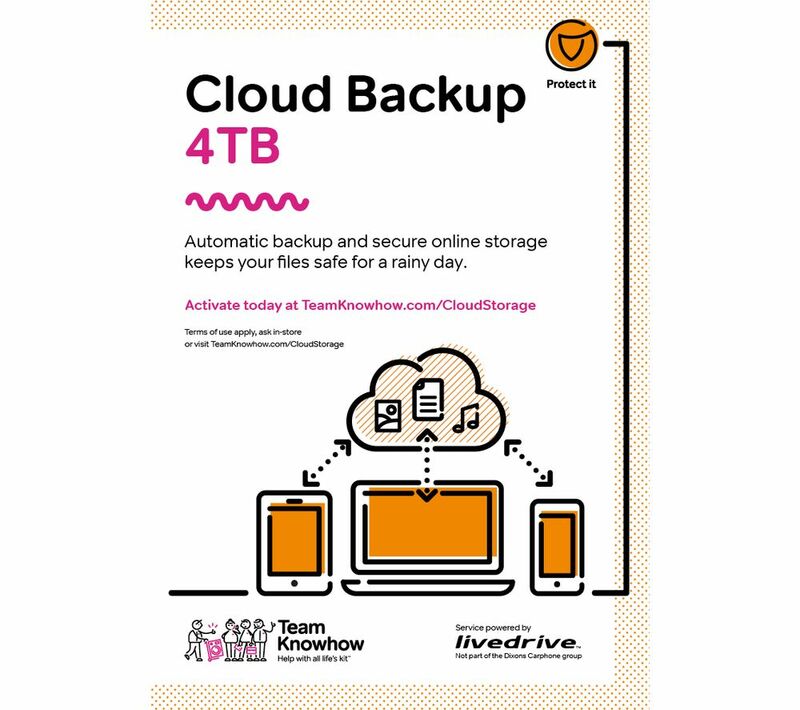 Back up your files with Cloud Storage from Team Knowhow. If you are concerned about losing those precious memories, important data files and all your favourite music through theft, loss or general breakages then look no further than Cloud Storage from Team Knowhow. The Cloud Storage 4 TB Service automatically uploads files for 5 years. Your data will be backed up at our secure UK data. The Cloud Service automatically backs up your files online, easing worry when it comes to losing your favourite content. With both web and telephone support available you will be able to rest easy that your personal information is in safe hands. This service provides 4 TB of available space for you to upload files, allowing for a huge number of pictures, videos, music and data to be stored. You'll be able to back up from five devices. With the Cloud Storage Service you will even be able to view your files remotely - access your favourite snaps from any internet enabled computer and edit them with retouching, thanks to our special image editor. 2. Follow the onscreen prompts and enter your details in the boxes. You will need to register your card details but no payment will be taken at this point. In the TXN box you will need to enter your order confirmation number which will have been emailed to you. 3. Follow the instructions on screen to complete your set up. - Backup is supported from computer or mobile phone (Android / iOS only). - Android / iOS backup supports backup of photos/video data only. Mobile charges apply. - Streaming of DRM protected media (i.e. iTunes movie downloads) is not supported. Takes ages to upload, Ive wasted a month already uploading.